14. Tampa Bay Buccaneers – Love the direction of this club, as Josh Freeman is going to have a solid season and the run game should be better. Raheem Morris got 10 wins out of them last year, and it wouldn’t be a surprise to see 10-11 this year. Subscribe to Buccaneers Gab via RSS Feed or E-mail and receive daily news updates from us! Are the Buccaneers a Darkhorse to Win Super Bowl LIV Next February? 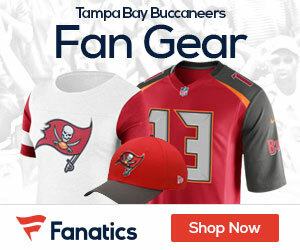 Sign up to receive our daily Buccaneers Gab newsletter, and keep up to date with all the latest Tampa Bay Buccaneers news. Celebrity Seats has all the best Tampa Bay Buccaneers Tickets, Tampa Bay Rays Tickets, and Tampa Bay Lightning Tickets!